Welcome, c'mon get your feet wet! 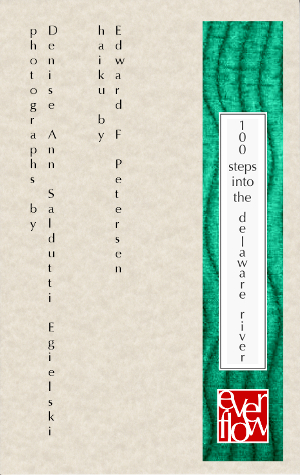 This hand crafted book was inspired by the Delaware River from her confluence with the Lehigh River down to the celebrated place of George Washington's strategic crossing. We are blessed to live close by this marvelous stream especially along this particularly sublime stretch of her everflow. The Delaware is truly an incarnation of Mother Nature. She nurtures a multitude of our human, animal, vegetable and mineral brothers and sisters who reside with us beside and beyond her banks. Not only a doting parent, she is an alluring friend and beautiful beyond depiction. We endeavor by these images and insights, if not to touch, at least to point toward the Delaware River's indescribable loveliness . . . and indeed remind you of your own.